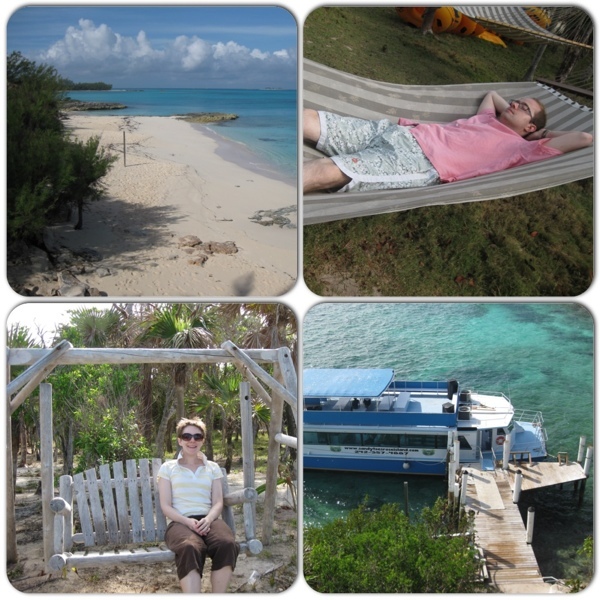 Following our early celebrations we flew off to spend Christmas proper in the Bahamas. I realise this sounds terribly jet-set, but is a big advantage of having family living in interesting places! Christmas day itself was a little strange in the best sort of way, with familiar activities – food preparations, present opening and feasting on turkey with all the trimmings – mixed in with a morning swim and eating lunch in the garden. 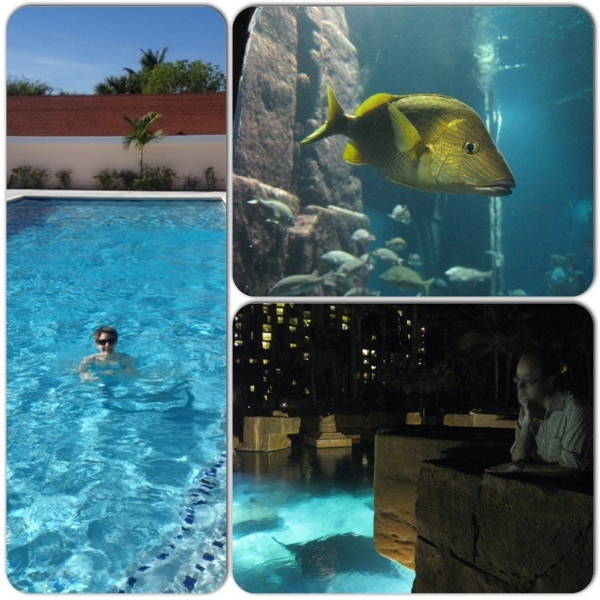 We also enjoyed the novelty of an evening walk around the Atlantis resort on Paradise Island (especially the aquarium), and a midnight outing to Junkanoo. Junkanoo is a traditional festival in the Bahamas, a parade between midnight and around 10am held on both Christmas night and New Year’s Eve. Originally a slaves’ occasion, costumes are constructed from cardboard and styrofoam and covered with brightly-coloured crepe paper, fabric, feathers and sequins. 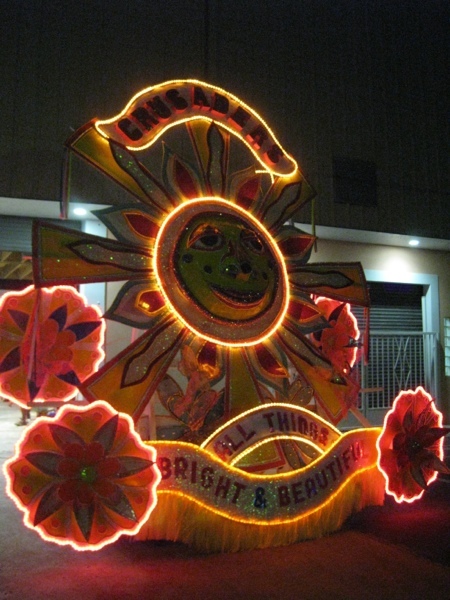 These days the parade is dominated by a number of organised groups, who are sponsored by local businesses and spend months planning and executing their themed designs, and the whole thing is judged with prizes awarded for best costumes, dancing etc. We only stayed at Junkanoo for a couple of hours, in which time around 5 groups went past our spot. The big groups consisted of one or two main floats on wheels, some smaller structures carried by 1 or 2 people, a band (comprised mainly of brass instruments, drums and cowbells) and lots and lots of super-energetic dancers in fabulous costumes – we were told that the biggest groups have over 1000 people. It was a really exciting thing to watch, totally different from anything we’d seen anywhere else, and incredible to think that not only do they turn out to do it all over again a week later but that the costumes are all different for the New Year parade as well. Boxing Day saw us hopping on a boat to head over to Rose Island and the Sandy Toes resort. My cousin had recommended it as the quintessential island experience, and we weren’t disappointed. Most of our fellow daytrippers piled straight into the sea as soon as we got to the beach, and we were tempted to follow them into the crystal-clear water. However, a tentative paddle made us think again – the water was freezing! We spent the day alternately reading in the shade and enjoying the sunshine, wandering along the beach and sitting in hammocks and swing-chairs. The 27th was our last full day of holiday, and we spent it sightseeing around Nassau and New Providence Island, with a drive around the western end of the island, lunch at a farm, and then an afternoon exploring some of the more historic parts of Nassau itself. 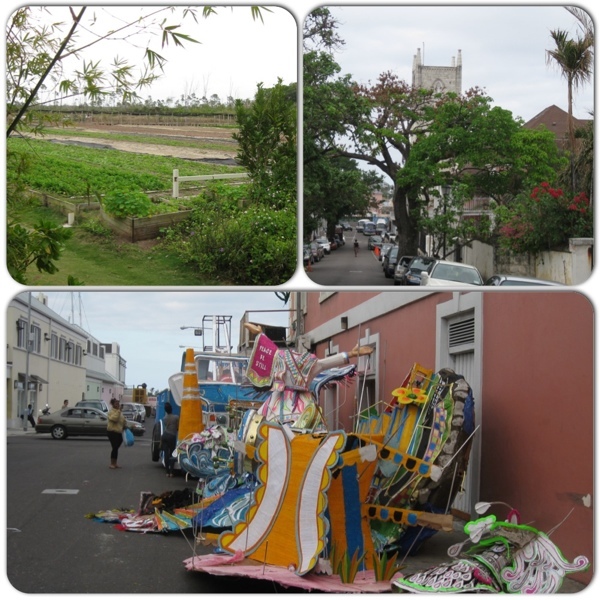 I was particularly taken with all the old pastel-coloured buildings, and we enjoyed spotting costumes left over from Junkanoo abandoned here and there. As we headed back to New York the following day we were both a little sad to be leaving – we’d had a lovely time with my relations, and the weather couldn’t have been nicer for Tom’s first tropical Christmas – and given that it’s just a 3 hour flight away I hope we’ll go back sometime. Click here for more photos, if you’re interested. This entry was posted in Holidays and tagged Bahamas, Christmas, Junkanoo, Nassau, Paradise Island, Rose Island, Sandy Toes by Emma Davidson. Bookmark the permalink.